Equestria is... quite the special place. Similar to Earth in the fact that it houses life on the planet, but that's really one of the only main similarities. Instead of being populated by many species of animals and humans, you just... remove the humans and replace them with Pony! Ponies who can talk to each other, ponies that are able to live in a society with other ponies, and ... they have pictures on their flanks. These ponies also eat what regular ponies eat (hay, apples, grass...), still walk on all four legs just like any other ponies, and... yeah! Haha. But they're not just any type of pony, oh no. There's different kinds of Pony!There's the Earth pony, who are the normal species of Pony. They lack horns or wings like the other species of pony, but they are known for their connection to the land and animals around them, and the fact that they're stronger than the other species of ponies and are able to do more physical labor than the others. Then, there are the Unicorn Pony. These are the ones who are not only special because of their signature horns, but they also are able to tap into magic. Their abilities are based closer to what their cutie marks are to represent, such as Rarity's magic being centered towards making clothes than anything in general. Last, but not least, are the Pegasus Pony. These are the winged species. Their jobs are mainly weather-based, due to the fact that they're able to control and manipulate the clouds and the weather in general.There are only two ponies who possess both wings and unicorn horns. These are the princesses of Equestria, Princess Celestia and Luna. These two pony help stabilize the harmony of Equestria and help day turn by raising the sun and the moon. The only times that their powers were challenged were against , in which they used the Elements of Harmony to seal away Discorde away and stopped him from spreading mass amounts of chaos. Of course, much later in the history of Equestria, Luna became especially bitter about the fact that while night was among the world, the ponies wouldn't play. Luna and Celestia end up arguing about this, and in the end, even if Celestia didn't wish to, she sealed Luna in the moon (In which she become Nightmare Moon).Nightmare Moon later escapes, in which Twilight and her group of new-found friends have to band together with the Elements to stop Nightmare Moon. Each pony takes on the respected Element of Harmony (Those of which are Loyalty, Generosity, Honesty, Laughter and Kindness) and with a little bit of magic stop Nightmare Moon and change her back to Luna. Elements of Harmony are pretty dang awesome! Which, after the group use the Elements, the Elements had bonded themselves to the ponies, due to their own tight bond as the good friends they are. Anyways, harmony's back, things are great. Woohoo.Now onto other things. Like uh... oh! Another similarity between ourselves and the ponies. They're all separated into different classes just as if we were back on Earth. They take on many different jobs, from the poorer pony who tend to the farms, to the more luxurous ponies who tend to the spas or make the clothes. Pony life is still pretty great. Being a pony's great!! Yeah! !Each pony also has a special talent, or cutie mark, which are located on each side of a pony's flank. All ponies are born without a cutie mark and must earn it when they realize what their speciality really is. The granting of their cutie mark is possibly one of the most important parts of actually being a pony, and one of the things that they'll never ever forget. Cutie marks also can take some time for some ponies to actually acquire (such as the Cutiemark Crusaders, who are three fillies who have yet to acquire their cutie marks), and all ponies don't get them at the same time. Each cutie mark shows what their special talent is by the symbols they have, such as Pinkie Pie's three balloons, symboling her love for parties and making other ponies laugh, or Fluttershy's three butterflies because of the fact that she has the natural talent of communicating with animals.Of course, Equestria is not just limited to Ponyville, which is where the mane basis of the group of friends are located. Many of the mane characters weren't raised in Ponyville. Twilight Sparkle, for example, was raised in Canterlot before Celestia sent her down to Ponyville to learn lessons that would help the pony. Other places of mention are the cities of Appleoosa (A wild west-esq town), Cloudsdale (The city comprised of clouds in which weather is made and where the two pegasi - Rainbow Dash and Fluttershy - originated from), Trottingham, Manehattan, and Hoofington to name a few! Each of these towns - well minus Cloudsdale for obvious reasons - are able to house all types of pony.If you can't tell already, Equestria's built around a lot of pony puns, not only in their natural dialect, but also just... everything around them. No, seriously. Everypony talks like this, and it's normal.So yep. Everypony Equal, Everypony Loved. Pegasus Pony: Being a pegasus pony, she has the wings and flight ability of any other pegasus pony, but unlike other pegasus ponies, she enjoys being on the ground. Cutie mark ability: Flutter's cutie mark symbolizes that she has care and knowledge of not only the animals but nature itself. A unique ability considering that she's a pegasus pony. Wild animals: She's able to communicate and calm down wild animals! 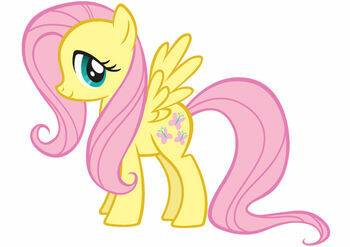 Kindness: Her Element of Harmony, if it isn't obvious, Fluttershy is all about Kindness. Whenever she isnt angry. THE STARE - At times, she's able to use a paralyzing stare on some animals to make them do what she needs them to do, such as making her chickens go back into their coop, or using it to get a Dragon to listen to her! Her main weakness is her fear. It dampers her ability to do many things, and if she's frightened to enough of an extent, she'll lock up and faint, which is especially bad if she's flying. She's one of the weaker ponies, beign that her strengths lie in her kindness and not her physical strength. Internal and external links of interest. Examples include your character's <a data-rte-meta="%7B%22type%22%3A%22internal%22%2C%22text%22%3A%22house%20page%22%2C%22link%22%3A%22Houses%22%2C%22wasblank%22%3Afalse%2C%22noforce%22%3Atrue%2C%22wikitext%22%3A%22%5B%5BHouses%7Chouse%20page%5D%5D%22%7D" data-rte-instance="166675-19880025554f46400486c8b" href="/index.php?title=Houses&action=edit&redlink=1" class="new" title="Houses (page does not exist)">house page</a>, <a data-rte-meta="%7B%22type%22%3A%22internal%22%2C%22text%22%3A%22events%22%2C%22link%22%3A%22events%22%2C%22wasblank%22%3Atrue%2C%22noforce%22%3Atrue%2C%22wikitext%22%3A%22%5B%5Bevents%5D%5D%22%7D" data-rte-instance="166675-19880025554f46400486c8b" href="/index.php?title=Events&action=edit&redlink=1" class="new" title="Events (page does not exist)">events</a> they partook in, important canonmates, outside resources for more details on your character, and so on.